SANTA ANA, Calif. – November 7, 2018 – Silex Technology, Inc., a global leader in wired and wireless networking solutions, today released the FreeRTOS wireless driver for its SX-SDMAC “Smart-Ready” SDIO module based on the Qualcomm® QCA9377 chip. The SX-SDMAC is a wireless connectivity solution designed to deliver superior integration of wireless local area network (WLAN) and Bluetooth low-energy technology – engineered to support 1 × 1 802.11a/b/g/n/ac Wi-Fi and Bluetooth 4.2 + HS. This release offers “Plug-n-Play” solution allowing manufacturers to easily add Wi-Fi and Bluetooth capability to their NXP i.MX-RT based devices. NXP® i.MX RT crossover processors bridge the gap between microcontrollers (MCU) and applications processors. These processors bring applications processor-level performance into the MCU world to support real-time, performance-intensive processing functions. Silex offers hardware and software for users to easily add 802.11ac wireless connectivity to i.MX RT devices that require high performance for their target applications. In addition to the SX-SDMAC, Silex Technology offers SPI interface based single-band and dual-band Wi-Fi radios in the SX-ULPAN. SX-ULPAN is a lower cost option, based on QCA4004 radio, which may be suitable for typical IoT sensory applications that are low power. The SX-ULPAN is an ultra-low-power Wi-Fi module available as either a single band or dual-band 802.11n module and available with industrial temperature support. 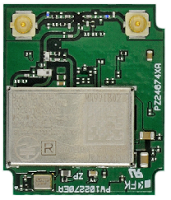 This low power Wi-Fi module is based on QCA4004 radio from Qualcomm. SPI interface drivers for SX-ULPAN are built into the i.MX RT SDK. To expedite the product development process, Silex also provides additional world-class engineering services including custom driver development, certification services, and hardware schematic design reviews. The SX-SDMAC drivers for QCA9377 are available for immediate download for evaluation purposes. Users must complete the evaluation license agreement online. For usage in production, please contact our sales department at sales@silexamerica.com. Silex Technology builds on more than 40 years of hardware and software connectivity know-how and IP, custom design development experience, and in-house manufacturing capabilities, bringing value to customers with a foundation of technical expertise. With relentless attention to quality, exclusive access to Qualcomm Atheros expertise, and strategic partnerships with leading semiconductor providers, Silex Technology is the global leader in reliable Wi-Fi connectivity for products ranging from a medical device to a document imaging product to a video or digital display. With Silex Technology, customers get a single vendor that provides hardware and software support from design through manufacturing for successful product after successful product. For more information, please visit www.silexamerica.com. QCA9377 and QCA4004 are products of Qualcomm Technologies, Inc. and/or its subsidiaries.